Bozeman’s original coffee house was established in 1977 and continues to be a favorite meeting place for locals and out-of-towners alike. Freshly air-roasted coffee and gourmet espresso drinks, exotic teas, pastries that are baked in-house all day long, and superior service make this wonderful place addictive. 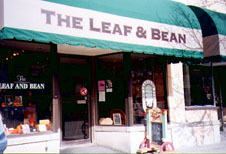 In the Bean’s authentic coffee house atmosphere you can surround yourself with original art from local studios, and enjoy live entertainment several nights a week. It’s a Bozeman tradition. Open early seven days a week for people on the go. We had the final artist's reception for 2004 on Friday November 19th at Paradise Art Works in Livingston. A special thanks to David Lewis at Paradise Art Works, the organisers of the Livingston Art Walk and everyone for all their help. 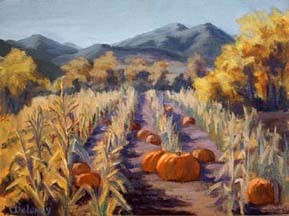 Lisa was also busy attending classes by Bozeman artist Aaron Schuerr. Lisa was been busy capturing the fall colors in the region. In addition to her favorite spots around Bozeman she also managed to get some scenes from Tom Miner Basin in the southern part of Paradise Valley. Did you know those red, yellow, and orange hues are always present in leaves? The green chlorophyll masks the hues until fall when the trees no longer want their leaves acting as their personal food factories. Different leaves have different colors. Here are some: Yellows:aspens, basswood, beeches, birches, butternut, elm, maples (boxelder, mountain, silver, striped and sugar), mountain ash, poplar, willow. Reds: sugar maples, black, red, scarlet, and white oaks, sumac. Browns/Yellows: black and white oak. Purples: white ash and witch hazel. Bozeman artists were invited to "Imagine a Park," and the resulting creations are part of FORParks (Friends of Regional Parks) three-week-long art show and sale. "Imagine a Park" was at First Security Bank, downtown Bozeman, from September 7-13, 2004, and then at the Bozeman Gallatin Valley Mall for the two weeks ending September 27. FORParks is at the forefront of raising money for a regional park to be built at a site along Baxter Lane. Development of the 100-acre parcel is under way with one of two small lakes already dug. 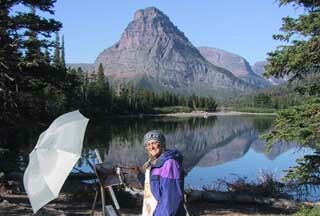 Lisa had another art adventure visiting Glacier National Park in Montana. 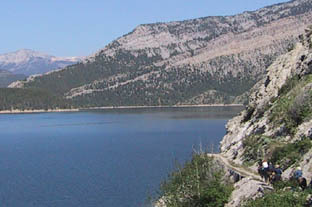 She painted several scenic spots around Two Medicine in the south eastern part of the park. Early mornings were the best time with the clear mountain reflections on the still water of the lakes. We had a very succesful artist's reception on Friday June 25th at Paradise Art Works in Livingston. 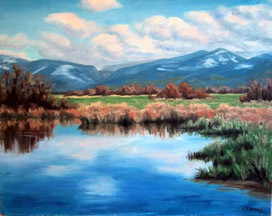 Several of our paintings were sold, including the MIA first place winner "Calm Spot on the Gallatin". A special thanks to David Lewis at Paradise Art Works, the organisers of the Livingston Art Walk and everyone for all their help. 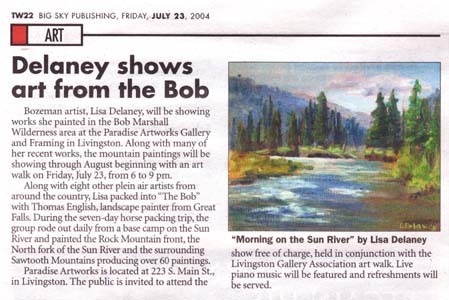 Lisa was also busy in the week before the Livingston reception, she attended a 3 day plein air workshop held by the Chapparal Fine Art Gallery in Bozeman. 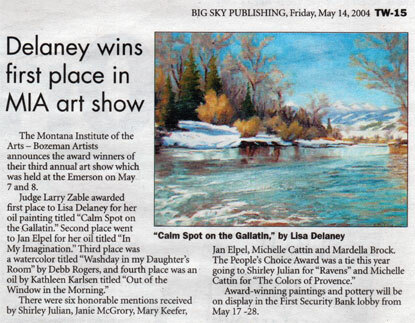 "Calm Spot on the Gallatin" wins first place out of 78 entries in the 2004 Annual Show for the Montana Institute for the Arts in Bozeman.